Hooray! I am back with lots of delightful memories with friends so dear! I’ve been in California for a couple of weeks visiting family and friends, eating, playing, laughing, soaking up the sun and blowing my nose! Yup, the last week I was a sick puppy with the worst head cold! Oh good gravy! But, I made the best of it though…got a lot of rest and TLC from my fabulous hubby and I got to read! (I love reading, but with my days so busy, I can only do so by snatching moments here and there.) Fortunately, I did get some good shopping and girl-talk in with my sister Sherry (Prairie Home) and friend Catiena (Vintage Housewife). 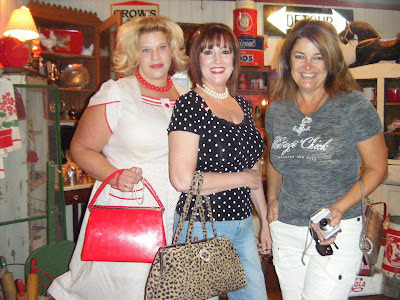 One of our favorite stops at the Orange Circle is Down Home Antiques. Charm dripped like sweet summer honey around every corner! Take a look-see at my adorable and sassy friend Catiena…she is wearing an authentic 1940’s vintage outfit including her lipstick-red Box Purse. Love it!! 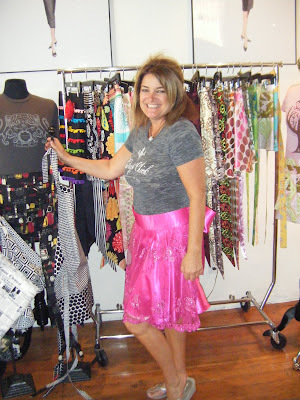 Sherry is showin‘ off her “Vintage Chick” T-shirt that she designs and sells on her blog. 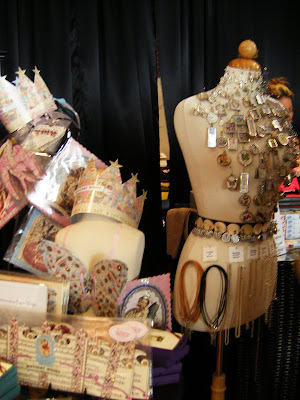 We also found this amazing Apron shop called Heavenly Hostess!! I’m talkin‘ apron candy here!! 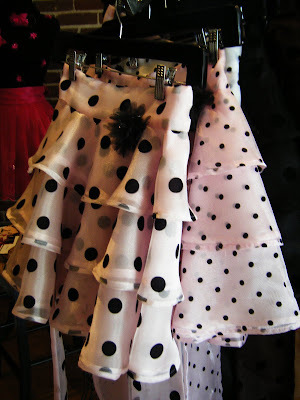 Can you believe these twirly-whirly, polka-dotted beauties are aprons! 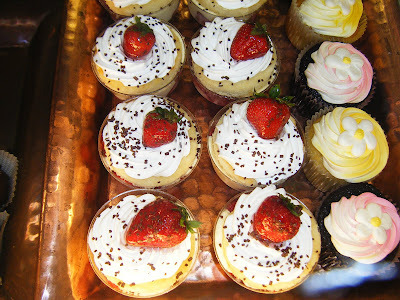 Heavenly Hostess is a perfect name, don’t you agree! I’m pretty sure I heard angels singing while we browsed! everything you whip up in the kitchen, will most definitely taste heavenly! We met the owner and designer of Heavenly Hostess! Cynthia Wadell was an absolute delight! So fun and girlie! Us girls chatted, giggled and squealed! When we left, we hugged and felt like we had known each other forever! 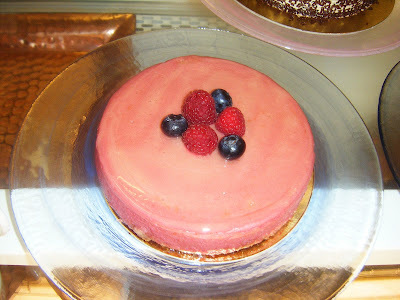 from jewelry, darling dessert dishes, to cookbooks! 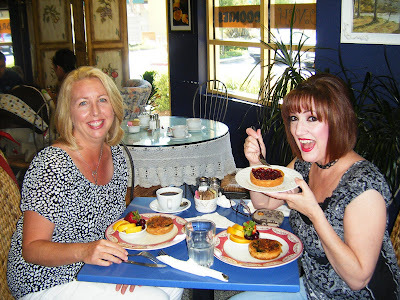 We shared good conversation and a very yummy Cherry Tart…..
My friend Denise is a kindred spirit and she’s as sweet as a cupcake! Well, y’all know what it’s like for us Mother Hens to get back home from a vacation, we feel blessed to be back in our nest and we’re motivated to freshen up the feathers, so to speak! There’s a lot to do! 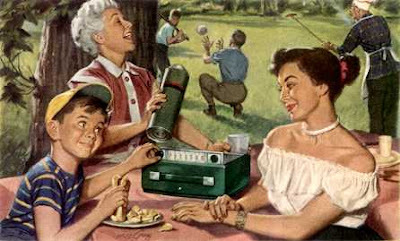 Summertime is here and it’s time for me to make some homemade plum jam, grow tomatoes, basil and parsley, plan some picnics and barbeque’s, sit out on the front porch with some good ol‘ southern Sweet Tea and a fresh slice of Lemon Icebox Pie and watch the fireflies dance….what could be better than that! What a blessing indeed! Thanks for stopping by for some “That’s What I Did On My Vacation” pie! I just recently found your blog and LOVE IT! I feel like I’m on vacation just by reading your posts. You are an excellent writer and full of southern hospitality. It is so much fun coming over for a visit. I’ll be back soon! Welcome Home!! I have missed your cheerful posts. It sounds like you had a fun vacation except for that darn head cold. I was having Warm Pie, Happy Home withdrawls!! Blessedly, Cat showed a pic on her blog so we all knew you were having fun! So sorry about your nasty cold. Glad you are on the upswing and I can’t wait to see what “nesting” you do!! I’m relatively new to your site. I, too, enjoy your cheerful posts!!! yay!!! your back… I’ve missed reading your blog. I’m glad that you had a good vaca!! Thank Heaven you’re back, I missed you! 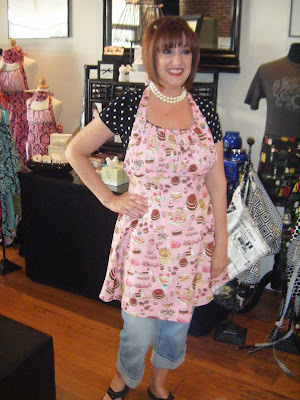 Love the pics of you and the girls and the apron shop looks fun! Except for that nasty head cold bit, it all sounds like great fun! 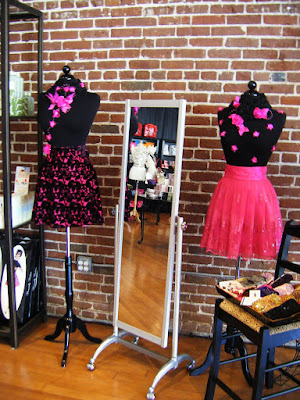 The apron shop is too adorable…hope that you picked up something fetching. Personally, I think the swirly numbers would look fabulous on you. Your sister and your friends are too cute! I hope you’re feeling better. Looks like you had a great time though. You surely bought that adorable pink apron didn’t you? Oh my…it looks so great! You had a wonderful time! And just look at those aprons…I am thinking I should be getting me one of those for my Chem Sunday excursions into the kitchen! HA! 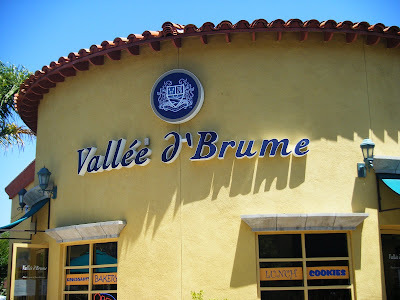 We were just in Old Town Temecula recently. We stopped on our way home from a vacation in San Diego. I absolutely LOVED Old Town Temecula. It’s only about an hour from our house and I definately plan on going back and spending some time. We didn’t stay too long but one of my favorite shops was Rooster Creek. Lots of cute things. I enjoyed reading about your trip…sounds as though you had a delightful time. I’m glad you had fun, but I sure missed your sassy ‘pie’ posts while you were gone! You are such an encouragement and blessing to us readers! Instead of celebrating their 48th wedding anniversary in MO…they had a ‘delightful’ stay on the surgical floor at our regional hospital! I’m glad you had a great trip…being with family is always a blessing! Thanks for sharing about all your experiences and photos! Loved it! So glad you enjoyed yourself, but glad to have you back! Look forward to reading more posts! I am glad you and the other ladies had such a wonderful time! That apron store looks awesome!!! God Bless You! Have a good week and Sabbath! Welcome back – I feel as if I’ve enjoyed a vacation – virtually! Sounds like it was fun-filled. Those pics are scrumptious! ‘Specially that tart! I’m happy your home!! I check for new posts because I love your blog!! 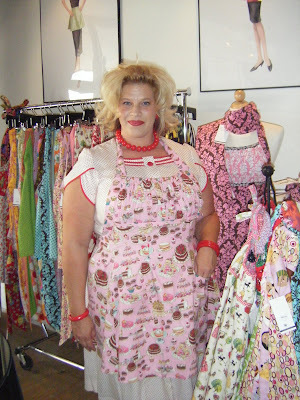 Hi Ruthann what gorgeous aprons! I wish we had a shop like that around here! Glad you had a great holiday. Sorry you’ve been sick! 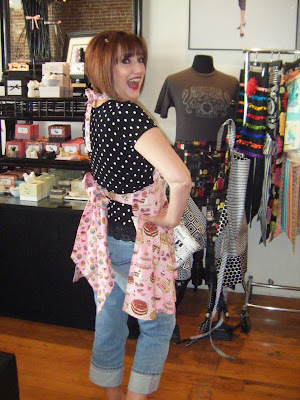 Those aprons are just precious and what fun those would be to have on hand while puttering around the house! I love it! Thank you so much for leaving me a note! Your blog was one I had in my list of favorites but lost due to the little invader on my computer. Off to enjoy this beautiful day. I still have the windows open! Loving that! I just ran across your blog and really enjoyed your story about the “pie lady” of the old photo! I also love pie (and everything else homey) but have had a difficult time getting the crust part down. It’s usually too thick on one side and fractured all over the place on the other. Does experience help? Hello, my comment was made by “anonymous” in the last post. I’m trying to figure out how to use this blog and didn’t mean to send anything anonymously. Hopefully, this will clear it up. Thank you for your prayers to our Heavenly Father for Edward and me…we felt the prayers going up and the blessings coming down…..
Ruthann! Welcome back doll! Lovely post! I have to check out those aprons for sure! Come by and pop in and say HI love to see you! Oh, you lift my spirits when I need some get-up-and-go! I’m a sit-still type of girl, but with three children seven and under, that is not an option! You give me energy! Looks like you had lots of fun! 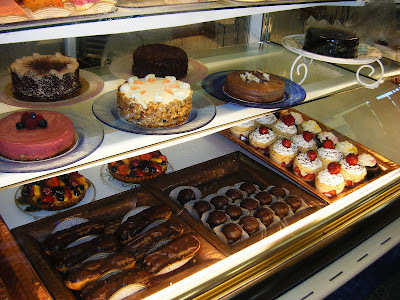 Pastries look yummy! You are so fun! :) I like this blog a lot! I’ll be stopping by a lot! Check me out and say hello! It’s cute as pie, Ruth Ann! I say the thing a girl needs is some vitamin “G” (girlfriend). 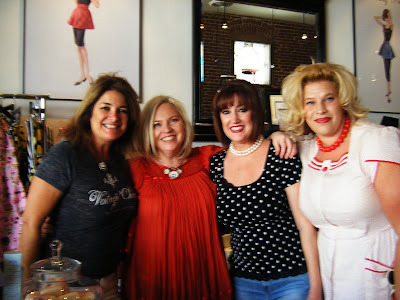 There is something that is so fun to get away with the girls and chat and shop! Having good girlfriends and a wonderful husband is truely priceless! I love the aprons super cute!!! Wish she was here in Texas and I would soooo be there! Darling aprons! Looks like you gals had a blast! Thanks for the recommendation, I live near Temecula and I take my mother-in-love to tea every year for Mother’s day and this place looks PERFECT! I also want to add that you are an absolute inspiration! You are truly a child of God and a great decorator to boot! I love your blog, I have spent the last 2 days looking at every single photo. I haven’t turned off my computer since I found you because I don’t want to lose my spot! I love reading your blog! I just found your site a couple weeks ago and am now reading all your back blogs so I can enjoy everything you’ve posted. I’m getting lots of great recipes and ideas! I LOVE aprons!! I wear aprons everyday; half aprons around the house and whole aprons in the kitchen. 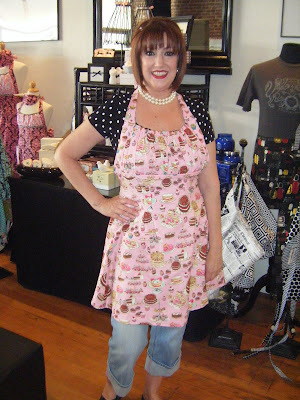 I also have an apron FB page; Aunt Kitty’s Apron Attic which I started about a year and a half ago and am having great fun sewing aprons for others! Aprons are just so feminine!! I love the apron you ‘brought home’ from your trip; so cute! !